Stop measuring price and start measuring demand and supply. 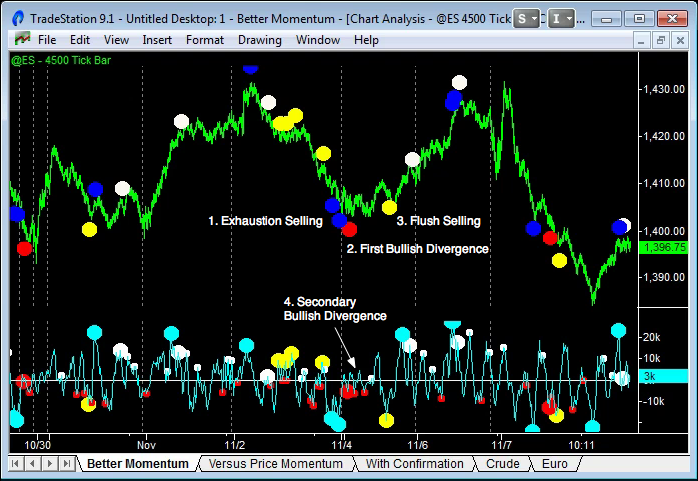 Momentum indicators have been calculated based on changes in price for decades. But that doesn’t make any sense – you’re just measuring the result, not the driving force. The driving force is demand and supply volume – the energy that drives prices. So why not use a Momentum Indicator that calculates buying and selling volume? “Better Momentum is my most valuable trading tool.” Jack B. “I am sold on your Better Momentum indicator.” Steve McG. “You make volume as visual as price.” Ralph R.
That’s what Better Momentum does – that’s why it’s a “better” Momentum Indicator – plus it generates demand and supply signals. It’s one of my 3 non-correlated indicators. The other 2 are Better Sine Wave (measures price) and Better Pro Am (measures average trade size). The next logical question then is “How do I know when all the sellers have sold or all the buyers have bought?” And that’s where measuring volume momentum comes in. Let’s take the example of an uptrend. The move starts off with an explosion of buying that takes the market past a significant resistance level. In the early part of the move Professionals, large volume traders are active. On any dips the buyers step back in and continue to drive the market higher. However, as the move progresses, Amateurs, who trade smaller volume, start to join in. Price continues to advance but eventually fewer and fewer buyers, with less and less buying volume, are participating. Professional traders start taking profits on any advances and the buying volume starts to decline. Eventually, a point is reached when all the buyers have bought. The market tops out and price starts to reverse. Sometimes we move straight into a downtrend. At other times we get a final blow off buying climax – Amateurs desperate to finally get on board. But the trend has changed and it’s now time to exit Long positions and Short. The chart above is a 2,097 tick bar chart of the Emini and highlights two reversals. The bottom was formed when a new low was made but the selling volume (as shown by the Better Momentum indicator) dried up. Similarly, the top was formed when a new high was made but the buying volume dried up. The red and white dots on the indicator and price bars indicate when buying and selling starts declining. The traditional Momentum Indicator, which seems to have no inventor, has been around forever. It has done a great job in the past of measuring the decline in Momentum as the uptrend move described earlier loses power. But it has a fatal flaw – it measures the change in price, not buying or selling volume. In years gone by, the only timely data traders had available was price. Volume data was either not available or was delayed. But times have changed. My data feed not only tells me the volume of every single trade, but whether it took place on the bid or the ask! Extraordinary, really. So let’s make an improved Momentum indicator. The Better Momentum indicator measures these waves of buying and selling volume and tells you when there is Bullish or Bearish Divergence. That is, in a downtrend, price is making new lows but the selling volume is becoming less and less – setting up for a reversal. And vice versa for an uptrend. The chart above is a 699 tick bar chart of the Emini and shows the Better Momentum indicator (volume based) along side the traditional Momentum indicator (price based) with the same settings. As you can see for the highlighted turning point, the Better Momentum indicator correctly identified fewer sellers participating in the move and a likely reversal. The traditional Momentum indicator totally missed that a turning point was being formed. You need to wait for at least the First Bullish or Bearish divergence signal to plot before entering a reversal trade. And in some cases it is necessary to wait for the Flush volume pattern to signal – showing that the last of the sellers or buyers have been “flushed” out of the market and the trend can now reverse with little resistance. The divergence algorithm used by the Better Momentum indicator is quite sophisticated. It doesn’t just look for the current peak to be less than the previous peak. But instead compares the current peak with a statistically significant prior peak. There can be a slight delay in the printing of divergence signals as a peak has to be confirmed. However, this delay is not usually a problem for trading because the divergence signals lead the market. Note: The Better Momentum signals plot in real-time on the price bars. But the signals are back-plotted on the momentum line itself. This is to show the peak or valley in momentum that actually generated the signal. The best way to use the Better Momentum indicator is with confirming, non-correlated indicators. Since the Better Momentum indicator is measuring waves of buying and selling, I use price cycles and average trade size as my confirming indicators. The last trick to identifying high probability trades is using these 3 non-correlated tools (Better Momentum, Better Sine Wave and Better Pro Am) on multiple time frames. Update your Momentum Indicator to measure volume not price. Modern data feeds now show you buying volume (demand) and selling volume (supply). Traditional Momentum Indicators only used price as a proxy for demand and supply because the volume data was not available when they were conceived. Only take reversal trades after you see Exhaustion Volume. Exhaustion Volume needs to be present to confirm a bottom or top – all the sellers need to have sold (i.e. selling volume dried up) or all the buyers need to have bought (i.e. buying volume dried up) for a reversal in the market to take place. Wait for Bullish or Bearish Divergence to signal a market is ready to turn. After Exhaustion Volume look for Divergence patterns where, in the case of a market bottom, price makes a lower low but selling volume makes a higher low (Bullish Divergence). In the case of a market top, price makes a higher high but buying volume makes a lower high (Bearish Divergence). Look for confirmation from non-correlated trading indicators. In my trading I use 2 non-correlated indicators: Better Pro Am to identify Professional and Amateur activity and Better Sine Wave to identify Support and Resistance levels. High probability trades can be found by combining these Bullish and Bearish Divergence signals on the Better Momentum indicator with Professional activity supporting a change in trend and breaks of key Support or Resistance levels. The Better Momentum indicators are really great - I like the new features that you added as well ... I really LOVE the Better Momentum indicator - I think it is fantastic. Better Sine Wave is fantastic; Better Momentum is fantastic. Better Momentum seems to do the best for me. It gives me confidence to hold thru an adverse move seeing when the vol. diverges. It's like having an ultra sound of the price enabling me to see what is below the surface of the price action. I've been following you since September of 2013. I can't believe I waited so long to buy your indicators. I love Better Momentum. It is an integral part of my trading. The Better Momentum indicator has become my most valuable trading tool. Well done! Thank you for the Better Momentum indicator! I really find that I can look at CL charts in a more structured way and feel less bewildered. This is huge, thanks again, I am much more confident now with this indicator! And thanks for making them easy to use and for providing clear instructions! The new 'Flush' signal on Better Momentum is great - it's helped me to enter trades I was otherwise unsure of. Better Momentum has helped me out a lot. I like to use it on the 669 tick chart in conjunction with Better Sine Wave. I look for extreme readings and then fade and look for divergences, or the reduction of volume strength during down or up trends. Better Momentum has allowed me to much better understand tops and bottoms, and to discern when the market is resting during a trend and when that trend has come to and end. Did exceptionally well using Better Momentum! I really appreciate it!!! I purchased the Better Momentum indicator the other day and love it! The Better Momentum was a wake up call for me. I find that combining Better Momentum with SlowD and MACD, the indicators are able to pinpoint the tops and bottoms of cycles pretty accurately with the use of multiple time frames. I really like the Better Momentum indicator. It has really helped me in conjunction with your Better Sine Wave to read the market's direction. I also wanted to write you and say the videos you have posted with your intra-day trading activity have been perfect. It is very beneficial to watch you using the tools live. Thanks for your work and willingness to educate. Great improvements to the Better Momentum Indicator. You make volume as visual as price and I agree with you about its impact on trading. Keep up the good work ... Love your Better Momentum indicator. I am looking daily and weekly with stocks. I've found your divergence algorithm to be very powerful. I love Better Momentum - it has changed my view of the price/volume structure forever. Love the Better Momentum indicator ... Exhaustion is very reliable. I am sold on your Better Momentum indicator. I am currently using Better Momentum on gold futures and it really helps me. Keep doing the videos - they are a great learning/illustration tool!